Participants in the WSCFF Fire Ops get an orientation the evening prior to the event. 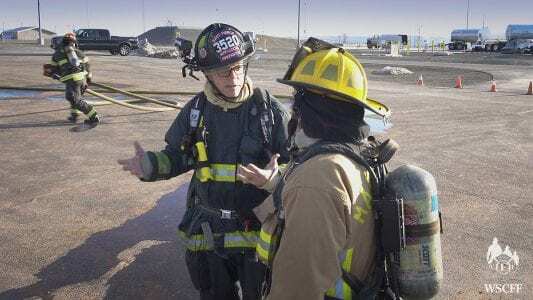 I am at the Hammer Training Facility in Richland, Washington learning what it is like to train as a firefighter at Fire Ops 101. Jen is just in front of her shadow Matt Lowery inside the fire room. Shifting positions, I’m having trouble getting up off the ground in this 25-pound suit with a 30-pound breathing apparatus on my back. It’s all I can do to right myself without falling backwards like a water bug with its legs in the air. Finally, I’m on my feet, staying low and trying to crawl to the stairs and up to the second floor. It’s so dark. My breathing is rapid. We get to the next floor and the light from a window is coming in. I’m exhausted and sweating profusely. It’s only 9:00 am and this was just the first event of the day. 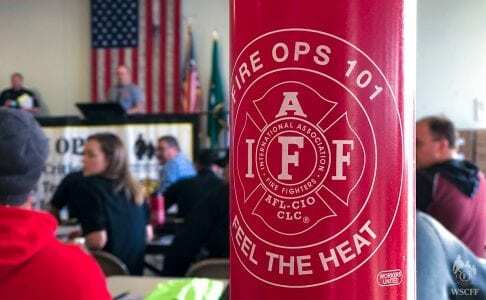 I was invited to Fire Ops 101 through my work with the staff and board of the Washington State Council of Fire Fighters (WSCFF). The event is led by Ricky Walsh, the 7th District Vice President for the International Association of Fire Fighters (IAFF), the union for professional firefighters across Canada and the U.S It’s a day when Union Locals can invite politicians, policy makers, and members of the media to spend the day as a fire fighter, learning about a work environment that is full of dangers and hazards, both physical and mental. The motto is: Time Critical. Highly Technical. Labor Intensive. You get that from the moment you step into those boots. Matt Lowery gets Jen Pennington ready for her first task. My shadow, Matt Lowery from East Pierce Firefighters IAFF Local 3520, was fantastic — articulate, funny and a natural coach and teacher. 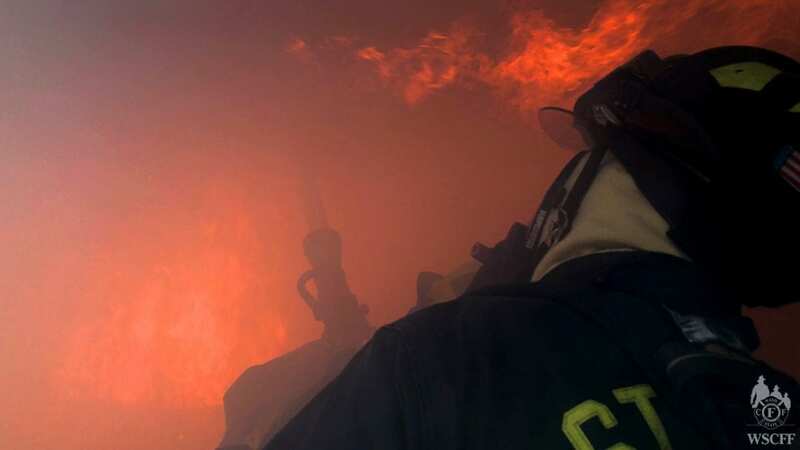 In the search-and-rescue exercise he had us crawling along the floor inside a building, feeling for the walls in a pitch-black, smoke-filled environment. Although the smoke was not real, wearing the respirator in this dark place is scary. At one point, Matt said, “Feel for the wall on your left. Keep your hand on the wall. You’re going to keep moving along the wall.” Moving along, I’d feel a corner, turn and follow that wall. Then I heard him say, “Jen, turn around.” e asked me, “Now, how are you going to find your way out?” I say, “By keeping my right hand on the wall and going back the way I came?” “Are you sure?” Now I was second guessing myself, which was exactly his point. How do you remember every twist and turn you make in the chaos of a scene, or if you had found someone, how would you orient yourself to get back out? The goal had been to look for a survivor and I had failed miserably. I’m pretty sure one of the guys was moving the mannequin closer to me and I still couldn’t find it, even with the thermal imaging device. I was just looking in the wrong direction. It was so easy to get turned around. Matt told me to imagine crawling along, in all that gear and having to go over or around obstacles like furniture or anything else in the way. This is how firefighters can lose their lives, by becoming disoriented and moving into the wrong spaces. Silence…what to say? The thought hits you like a brick. Next came the car extrication exercise. Technical experts ran us through the gear, training, expense and the super-large jaws of life and cutting tools. We learned to break glass and then each of us took a turn using the equipment to take apart the side of a car. How quickly fire fighters work to get a person out is astounding. It looks like sheer chaos from the outside, but every move, cut and break is highly controlled. Participants in the WSCFF Fire Ops learn about EMT and paramedic duties at during the MEGA CODE task. Our next stop was the MEGA CODE building where a paramedic walks us through what they see in their day-to-day job. We learned about chest compressions and some of the newer techniques they use. What’s impressed upon us is how much it costs to train — $30,000 alone for a mannequin capable of sending feedback to medical devices. After some brief hands-on training, our team took our silicon patient down a stairwell into a waiting ambulance. We piled in around the patient. The driver took off and I tried to do compressions, but it was incredibly hard to stay upright while the van was moving, especially around turns, and we were only going 20 mph. This one really got to me. I thought of my dad on several occasions and all his heart issues in the past. It became personal, fast. The ladder climb up 7 stories. The ladder climb, which I had ruminated on and heard so much about, was easier than I thought. 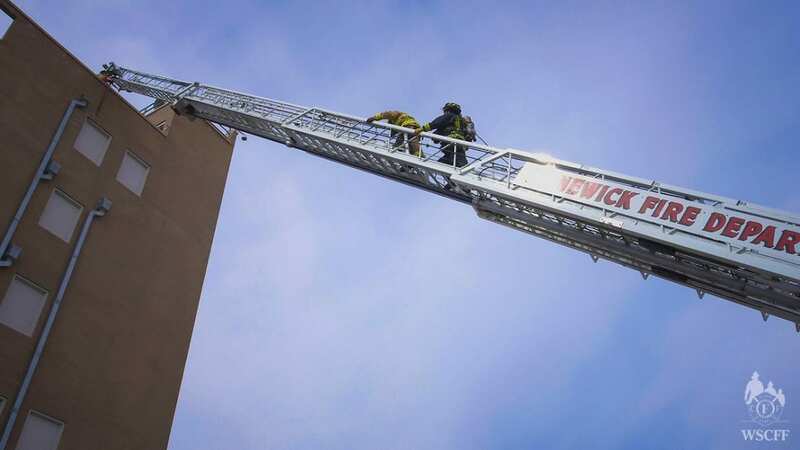 Maybe when you start the day with fire in your face and crawling in smoke and darkness, being high up off the ground just doesn’t feel like a big deal. So, with a huge carabiner attached to a thick safety belt cinched around my waist, I climbed up on the truck. A firefighter clipped me in and I took a deep breath. Matt looked at me and said, “You’ve got this.” And for the first time that day, I knew I did, and started to plod my way up, Matt behind me. I took a couple of breaks on the way up, and he asked, “Did you ever see that movie, What’s Eating Gilbert Grape?” “Yeah,” I said. “I’m climbing up the water tower! I’m climbing up the water tower!” Two-thirds of the way up and I’m laughing really hard while trying to catch my breath. I appreciated him trying to relieve any anxiety I may have had, and the obscure film reference. That day I walked away with a much better understanding of my clients. I had interviewed many of them for Power Through Participation videos, explaining the hazards they face on the job and why political action is so important to them. 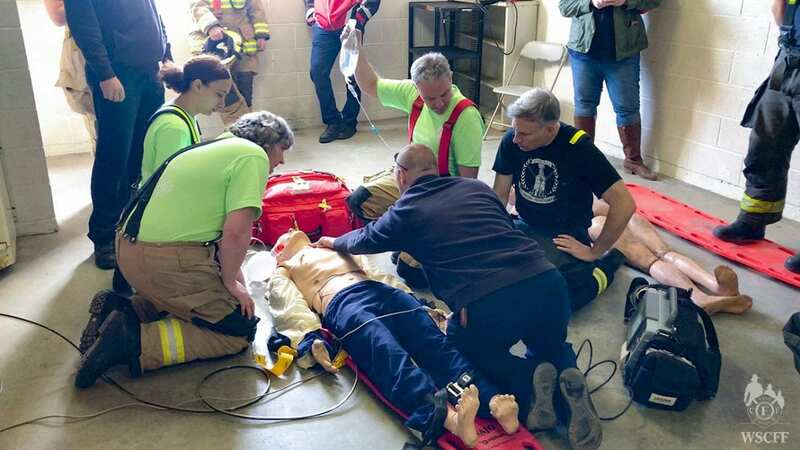 This experience brought all the pieces together: the laws that save lives and protect first responders, and the money needed for equipment, training and resources. What hit hardest were the stories. Like the frail, ill, unresponsive man in his nineties whose wife didn’t know where the DNR papers were when the paramedics arrived. By law, paramedics must start compressions, but they knew they would probably break his sternum. To me, that story wasn’t so much about the patient as it was about the things we do or don’t do as individuals that creates stress not just for our families, but for first responders as well. It gave me a whole new perspective and made me think about things I would do differently in my personal life. Since Fire Ops, I’ve been eating better and dropped a few pounds, not only for my health, but because someday, someone might have to get me out of a situation—a great motivator. I’ve been working on getting my paperwork in order—our list of meds, organ donation, location of wills, retirement plans and last wishes. Finally, we live in a heavily forested area, and we have dropped about 10 trees that were too close to the house, something we’d wanted to do for a long time. Between nerve-wracking windstorms and a creating a fire-safe space, we are in tinder clean-up mode as we face drier summers. It’s an experience that will stick with me for life, because I can honestly say I have been changed for good. Jen Pennington is the founder and creative director for The Rhizome Collaborative. Her company has worked closely with the WSCFF on many projects including the Power Through Participation videos, branding, presentations and both the WashingtonFirefighters.org and WSCFF.org websites.